With the right training, Google Analytics can provide a wealth of data to help plan highly targeted marketing campaigns and perform deep optimization on them after they're launched. Google is currently releasing a faster, more powerful version of Analytics that will help drive even more in-depth and insightful analysis. Jesse Nichols, Partner Program Manager for Analytics & Website Optimizer, will be hosting a series of webinars designed just for Agencies to help them navigate the new interface and also provide analysis and implementation tips and techniques. If you would like a reminder a few days before each webinar, sign up here and be sure to add placeholders on your calendar because you will not receive a calendar invite. If you would like to have webex remind you on the day of the webinar, please visit the “webinar link” for each session you plan to attend and register there. Completely new to GA? Check out our Getting Started Guide. 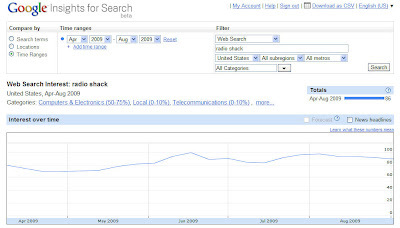 First, we used Google Insights for Search to show that from May-August 2009, there was a slight up-tick in interest in Radio Shack searches. Normally Q4 is the strongest quarter, but with this data, we could show the value of investing in branded keyword campaigns in Q3, as well. Next, Tony Frabotta and Whitney Smith from the account team at Mindshare created a Display Network campaign with automatic placements and keywords. To develop the campaign, we revisited sites that had previously been excluded, and realized that many were tech and Radio Shack relevant sites that had been excluded that had competitive click-through rates and conversion rates. In addition, competitors were on these sites, so felt that Radio Shack should be, as well. We therefore added them back into the campaign. We also opened up to anything related to electronics to grow reach and client base, as these sites served as push vehicles in search to drive online sales. From there, we developed an ad group that was tightly organized around variations of the branded keyword Radio Shack to help the Google system target content and map to more relevant sites. Finally, we also looked at Placement performance reports and excluded any sites that had not been performing. The campaign officially launched in July, and immediately outperformed branded search campaigns. July – September the ROAS was just under $7, compared to just over $5.5 for branded search campaigns, across engines. Yes! We traditionally have view contextual targeting as a way to create buzz for search and to leverage content across the Google Display Network. However, by using insights gained from direct response search campaigns, we use successfully use contextually-targeted display campaigns to drive both buzz and sales. Our overall blended ROAS would be lower and below our target goal. For more information on contextually-targeted display campaigns, visit the AdWords Help Center. To find useful data trends to inform clients' campaigns, visit Insights for Search. The campaign we focused on was Radio Shack's contextually-targeted campaign with brand keywords on the Google Display Network. Our goal was to improve the client's return on ad spend (ROAS). When Mindshare began working with Radio Shack in May 2010, we found that this campaign had a number of sites excluded, such as a broader range of sites in the tech and mobile space. We think the client was concerned that these categories of sites would not convert as well, especially during what is historically seen as a slow time in retail. However, we used this as an opportunity to re-visit the campaign together with fresh eyes. 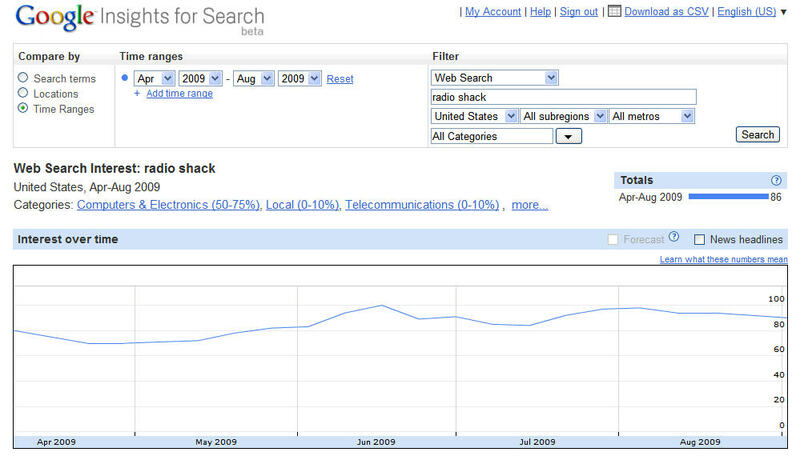 What Google solutions did you use to meet Radio Shack's goals? At Google, we believe that good data beats opinion. So we put a lot of effort into asking interesting questions -- How do new mothers use the Internet? When do people really start their holiday shopping? What are the latest trends of today's Hispanic web user? -- and then answering them with concrete information. We’re pleased to share this knowledge at Think Insights with Google, the website where we’ll be publishing our learnings and insights about digital marketing trends. From papers to case studies to videos, Think Insights' content represents the work we’re doing to better understand how web users are embracing new media platforms and how marketers are adapting to this changing terrain. We’ll be updating this site frequently, so if you'd like to keep up with our latest news, sign up here for your monthly Think Insights fix. He posits that "the future of our industry isn't wrapped up in how agencies are built; at the center remains the consumer and the hard work of telling compelling and authentic stories about clients' brands in a world of increasingly fickle and demanding thresholds of engagement." Visit AdAge and search on Torrence Boone for the complete story. With the right training, Google Analytics can provide a wealth of data to help plan highly targeted marketing campaigns and perform deep optimization on them after they're launched. Google is currently releasing a faster, more powerful version of Analytics that will help drive more in-depth and insightful analysis. Jesse Nichols, Partner Program Manager for Analytics & Website Optimizer, will be hosting a series of webinars designed just for Agencies. They will focus on helping you navigate the new interface and provide analysis and implementation tips and techniques. We are aiming to have the first webinar the week of May 9th on the Fundamentals of Analysis and Report Control in Google Analytics. If you are interested in attending any part of this webinar series, please sign up here. Join the May 3rd webinar to find out and learn to optimize your site for mobile users. Smart phones are changing the way we search for information, shop, use maps, watch video, interact through social networks and engage with advertising. As smart phone adoption grows, mobile users have come to expect quick and consistent interactions, anytime and anywhere. Agencies need to adapt mobile strategies to focus on the demands of users on the go. Research has shown that the majority of businesses, big and small, are still not ready to meet users' mobile needs. Are you clients' sites mobile ready? Please join Google Senior Mobile Account Executive, Elliot Nix, and Mobile Specialist, Shiv Kumar, for an upcoming webinar to learn more about how mobile site optimization can drive results for your businesses. recently posted about the new look and fee of the Ad Innovations site. Visit it to view new marketing technologies, watch demos and try the latest tools. Whether you’re most interested in search, display, mobile, or performance measurement, find a number of AdWords features to help you stay on top of the newest advertising developments. It's also live in six new countries: the United Kingdom, Germany, Spain, France, Italy, and Brazil. For the full post click here. Our friends at the Inside AdWords Blog recently posted about the new look and fee of the Ad Innovations site. Visit it to view new marketing technologies, watch demos and try the latest tools. backing the consumer patterns of time spent online, the question we’re left with is not whether advertisers will move dollars from TV to online, but how quickly? Types of Digital Video Advertising Used Past 12 Months – Overall, the only type of DVA used by a majority of media purchasing professionals (57%) during the past 12 months is Pre-Roll, however the gap between agency respondents (66%) and marketers (36%) is vast. In-banner has been used by more than four in ten (46%), overall, while expandable banner with video (34%) and rich media overlay (34%) have each been used by just over a third of respondents. Types of Digital Video Advertising Will Use in Next 12 Months – The landscape over the next 12 months will not look all that different from the past 12 months; the only type of DVA that respondents will reportedly be used by the majority of media purchasing professionals (58%) is Pre-Roll. The gap between agency respondents (64%) and marketers (42%) is still wide, but narrowing. In-banner (48%), expandable banner with video (40%), and rich media overlay (35%) will all be more widely used, while mobile video (35%) will see some serious growth. The majority of respondents planned to increase digital advertising spend (on average, by about 22%) - Respondents noted increased reach, ROI, and higher engagement levels as their rationale. The majority are likely to migrate a portion of their TV Ads budget to digital video - Overall, respondents noted track-ability, targeting, and efficient spend with less production costs as their rationale. Marketers skewed towards ROI as the reason for the shift, while agencies will shift TV ad dollars to online in an attempt to follow their target audience. The DVA format of choice was a :15 pre-roll on a CPM basis - When forced to select a single favorite or preferred DVA type, not surprisingly, pre-roll, the most used as well as the most planned to use, is the most preferred (30%) holding a two-to-one advantage across the board with all respondent groups over the number two type, expandable banner with video (14%). Overall, the research supports optimism for DVA in the industry, and highlighted where progress may be slowing. Agencies and marketers believe that digital video may have better ROI and engagement but both alike want more measurability and better metrics. We’re demanding more from our campaigns, and the future is bright for digital advertising. We hear it constantly from all sides, “Consumers are spending more time than ever online, and digital advertising is the wave of the future.” We hear this, and yet, it still seems like businesses face obstacles in bringing their promotion online. With research backing the consumer patterns of time spent online, the question we’re left with is not whether advertisers will move dollars from TV to online, but how quickly? Highlights include in-store sales lift, return on ad spend (15:1 in some cases) and halo effects on overall sales. Understanding the effect of search ads on offline sales is a large part of accurately defining the full value of search campaigns, beyond direct conversion. Consider these results and continue your own online to store testing. Do online search campaigns lead to in-store sales? Controlled studies we call ‘Online to Store’ experiments prove time and again that they do! Check out the video below for results from large advertisers that tested the effects of keyword targeted products and categories, generic keywords and online coupons. in AdWords can help you find keyword, bid, and budget ideas for your account. With each optimization idea, you’ll also see estimates for how the idea might affect your impressions, clicks, and cost. Until now, you had to log in to AdWords to view these custom optimization ideas. Now you can discover and use ideas from the Opportunities tab with the AdWords API. This functionality is exposed using the new BulkOpportunityService. The BulkOpportunityService returns new keyword ideas that may help you capture more impressions and clicks, budget ideas that may help you get additional traffic for campaigns that are meeting their budgets, and bid ideas that may help you increase or decrease CPC bids to increase traffic or reduce costs. If you use the Adwords API to build tools to manage your complex or large AdWords account, you can now extend your tools to surface or use the ideas returned by the BulkOpportunityService. If you have a tool that allows the modification of keywords in an ad group, you might display the keyword ideas returned by the BulkOpportunityService as ideas for that ad group. If you use a tool that allows changes to bids or budgets, you might also use bid ideas or budget ideas respectively and see the potential impact of those changes. Calling the BulkOpportunityService with a selector and a paging value, both specified in the BulkOpportunitySelector, will return a number of OpportunityIdeas that you can review and decide to accept or ignore on a case-by-case basis. For some examples on how to do this, look at the code samples provided with the client libraries. If you want to make changes based on ideas you retrieved using the BulkOpportunityService, you can make these changes through existing Campaign Management services such as AdGroupService, CampaignService, etc. We’ll be introducing the BulkOpportunityService as a beta over the next several days. Calls made to the service will be free during this beta period. We’ll post again to this blog when we are out of the beta period and will start charging. After you’ve tried the BulkOpportunityService, please share your feedback and experiences on the API and the client libraries at the AdWords API Forum. The Opportunities tab in AdWords can help you find keyword, bid, and budget ideas for your account. With each optimization idea, you’ll also see estimates for how the idea might affect your impressions, clicks, and cost. Until now, you had to log in to AdWords to view these custom optimization ideas. Now you can discover and use ideas from the Opportunities tab with the AdWords API.